For the fourth consecutive year, American Flowers Week (AFW) highlights local flowers and the people who grow and design with them. 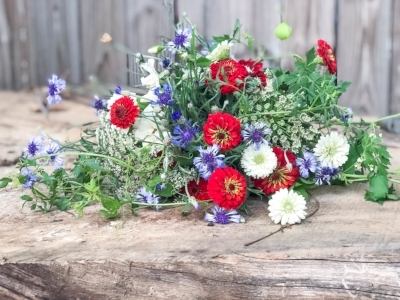 Founded in 2015 as a grassroots social media campaign, AFW has gained momentum across the U.S., with the hashtag #americanflowersweek so I encourage you to search the hashtag and see all the amazing things that USA flower growers are doing from dresses to red, white and blue bouquets. Here at Gilbert Creek Gardens we are getting into the action as well by giving away a JULY CSA membership ($70 value) which includes 4 bouquets, one each week in July. Pick up a USA FLOWER coloring page from one of our retail locations or at the Farmers Market this Saturday 16th. Also available for download below.